Trail Mixed Memories: A Whale of a Good Time! Newport Landing Whale Watching! #GIVEAWAY! A Whale of a Good Time! Newport Landing Whale Watching! #GIVEAWAY! A couple of weeks ago, my family and I were attending an Easter lunch in Palos Verdes. As we often did, we chose to take the "scenic route" which is Palos Verdes Drive West. This brings us along the cliffs of Palos Verdes and San Pedro where we see amazing sunsets over Catalina Island and occasionally whales splashing in the distance. On this day, I was looking out over the ocean at the sunset and SPLASH! What was that? I looked again. Now there were several splashes! There were whales a couple hundred yards off the cliffs splashing in the waves! I made my husband pull the car over to get a better look and possibly pictures. We pulled into the Terranea Resort parking lot to get closer but to no avail, they wouldn't let us in without paying. We drove down the road a short ways to Abalone Cove and watched from there. There seemed to be two whales making a big splash having a grand time! After a few photographs, we continued on our way. This experience stayed with me for days! I told my husband that it was about time that the kids got to see whales outside Sea World and we needed to take them out whale watching. Since we both grew up around the ocean, we both agreed that since Spring Break for the kids was the following week, we should look into taking them then. I looked around for specials. One name kept appearing more often than others for great deals, service and most importantly, the most sightings, Newport Landing. I looked online and found out the pricing, location, and times. They like you to call for reservations to ensure enough space. We arrived at Davey's Locker, a short distance from the Balboa Fun Zone/ferry, the next day. 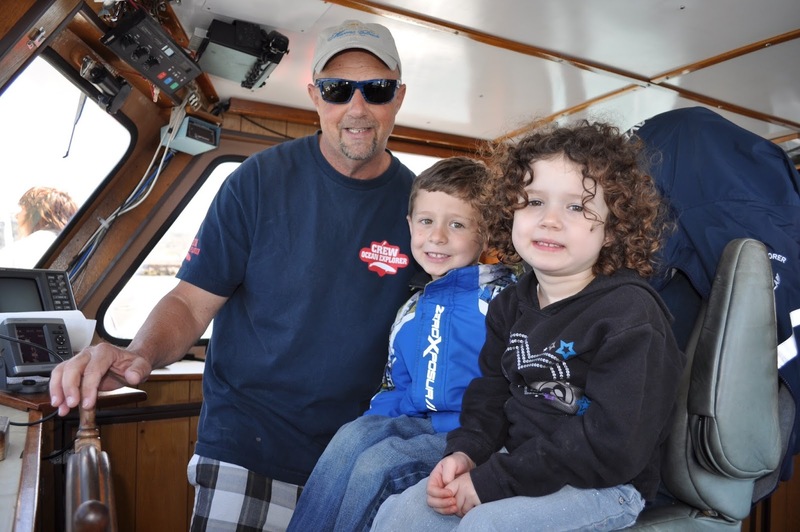 We were told we would be on the Ocean Explorer with Captain Larry Hartmann. We found the Ocean Explorer to be a very roomy, accommodating friendly vessel. 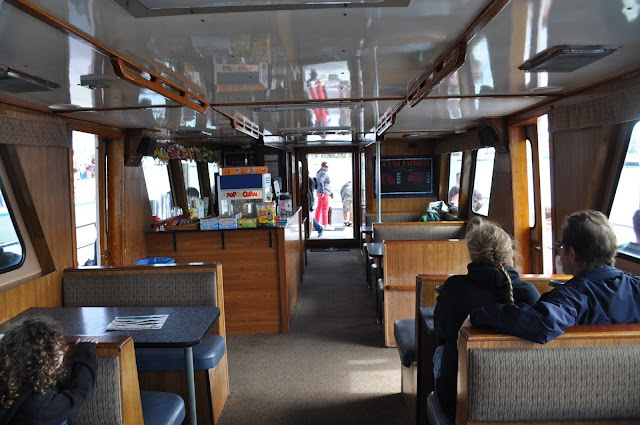 The crew was pleasant, friendly and answered any questions we had about the surrounding marine life. Several times throughout the cruise, we were offered half off drinks to quench our thirst. 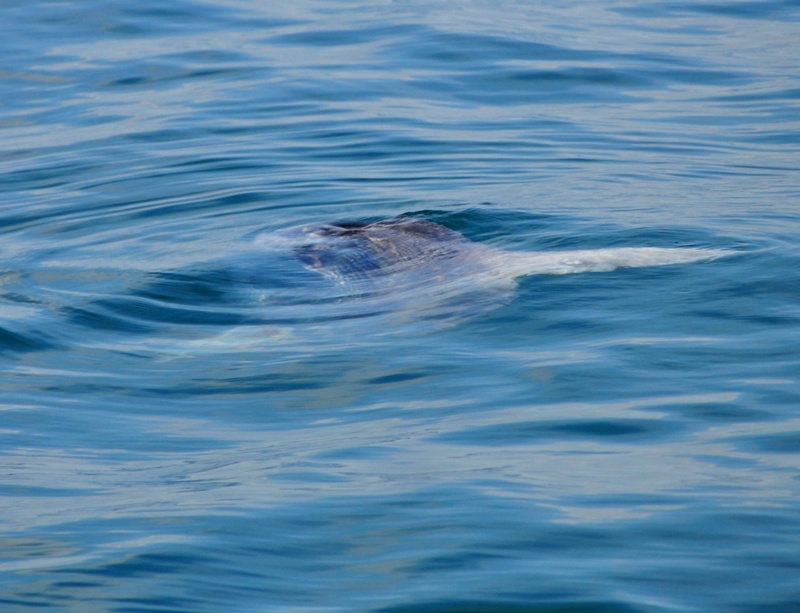 Not even 100 yards off the dock landing, we saw our first Marine life. Several large California Sea Lions had taken over the deck of a sailboat! 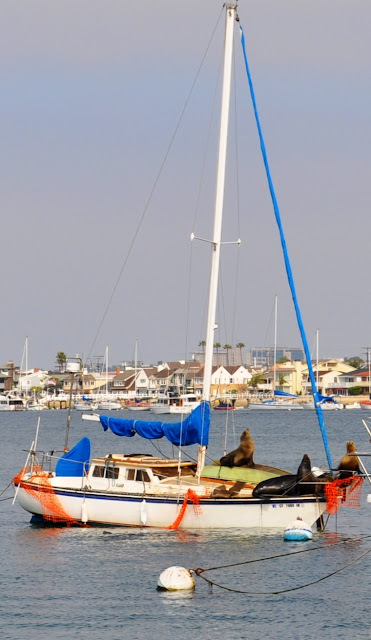 This occurs often and they have been known to sink small boats and docks! As we cruised out of the harbor, we were greeted by our first toothed whales, Common Dolphins. Dolphins are toothed whales and are not often thought of as whales but they are cousins to their larger counter parts. About a half hour travelling south, Captain Larry announces that we might be getting close to a surprise! 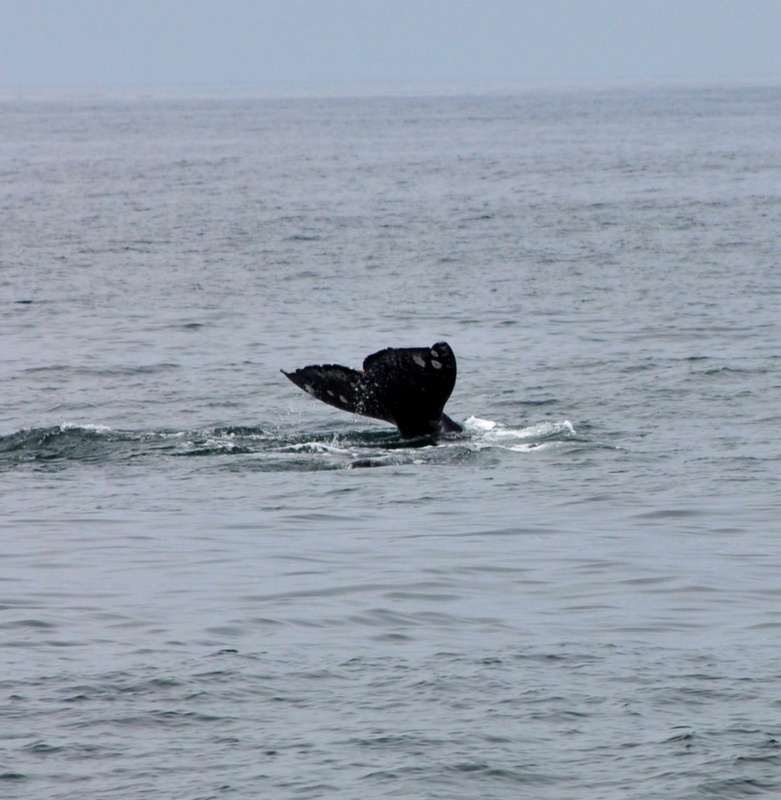 Sure enough, several common dolphins were playing with 2 Pacific Gray Whales! 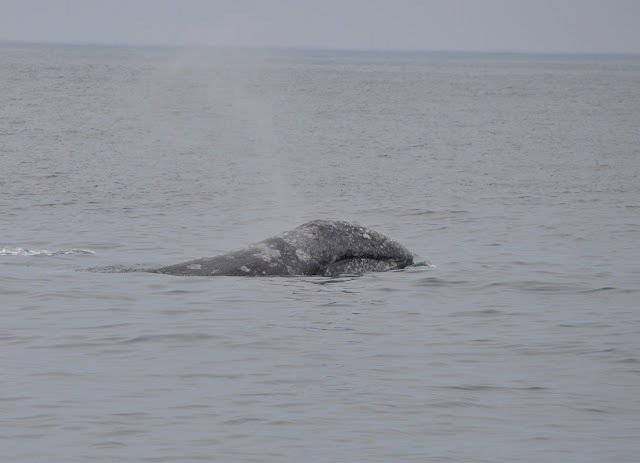 We had thought it would take hours to find one whale and here were dolphins and Gray Whales frolicking together. We followed them for about an hour before breaking off to see if we could find Fin Whales. 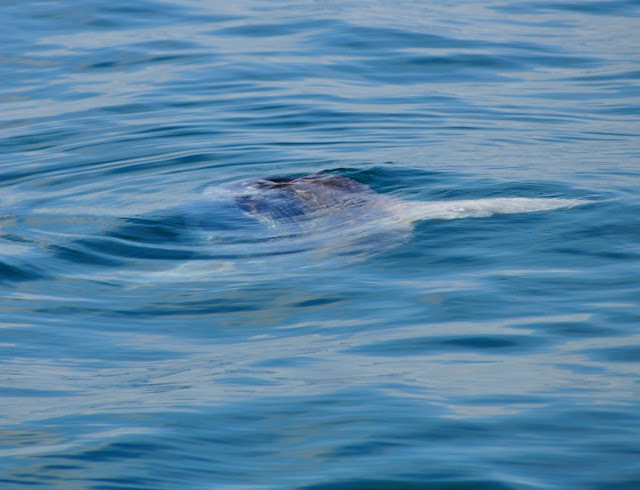 On our way to find Fin Whales, looking out in the waves I spotted a Mola Mola(Sunfish) just under the surface. 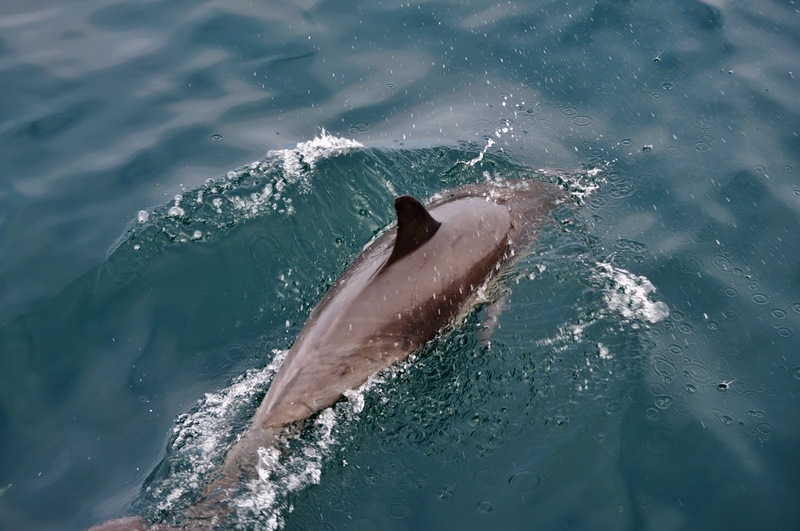 Jellyfish, sharks and baitfish(sardines) were also located near a small pod of Common Dolphins. The dolphins were clearly using their sonar to herd the baitfish to the surface where sea birds and sharks took advantage of a good meal. The dolphins were playful in the waves of our boat and we loved seeing them so close. We spent so much time with the dolphins, we had to head back before spotting any Fin Whales. We did however get to see more California Sea Lions as they sunbathed on the harbor buoy. As we rode into the harbor, I asked Captain Larry if my children could get pictures with him in the wheelhouse. He was friendly and knowledgeable and made sure that I had a great memory souvenir to bring home with us. 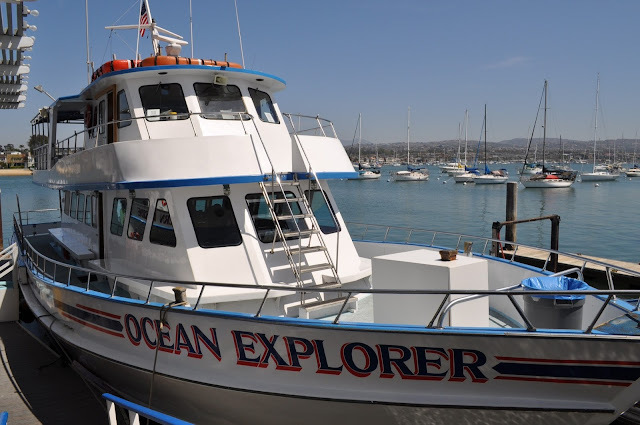 I was excited when I learned that since Captain Larry had been driving the Whale Watching boats for many years, he had compiled the best video footage and produced a movie, 7 Miles From Dana Point. 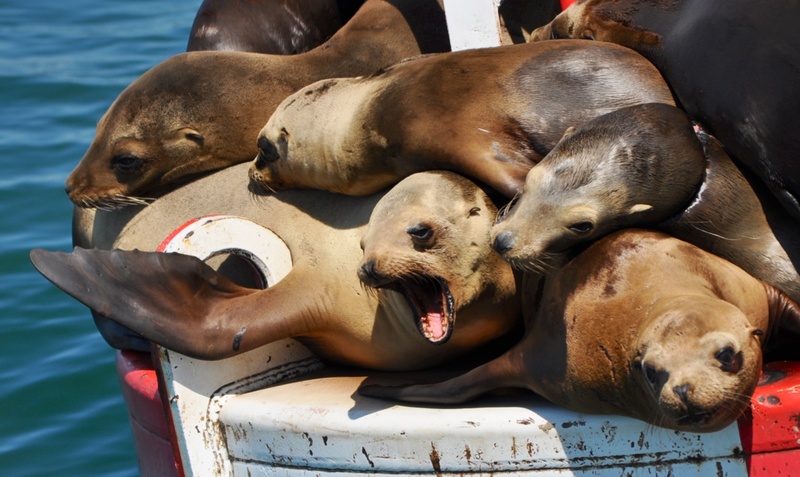 It showcased all the amazing wildlife along our Southern Coast. My family purchased the video so that we can visit the coastal marine life whenever we wanted to. Everyone on the boat that day received 1/2 off coupons to return another day to see even more. We had already decided that we would have to return between May and Nov. because that's when the largest of the majestic whales, the Blue Whales would be making their journey along our coast! The Gray Whales make their journey between Dec and April. My family's experience whale watching, was incredible! We got so close to these gentle giants and the ride home was filled with questions about the whales and other animals that we saw. It has instilled interest in nature in a way that learning from a book could never fulfill! If you want to create your own memories, please enter my free ticket #GIVEAWAY. If are not one of the two winners or want to go before the giveaway is over, I have special permission to give you 1/2 off tickets!!! DISCLAIMER: This is not a sponsored post. My family received free tickets to come whale watching for the purpose of this review. All thoughts and opinions are my own. Do not use any pictures without permission. All marine mammals are awesome, but my favorite are snow seals. I remember doing this kind of thing when I was a kiddo! So much fun. Great giveaway but I love seeing the dolphins play around together. Such a fun animal! It's great seeing them play on the bow of the boat! I love dolphins, sea lions, and whales! Whales are by far my favorite marine mammals. We would love to win some free tickets! 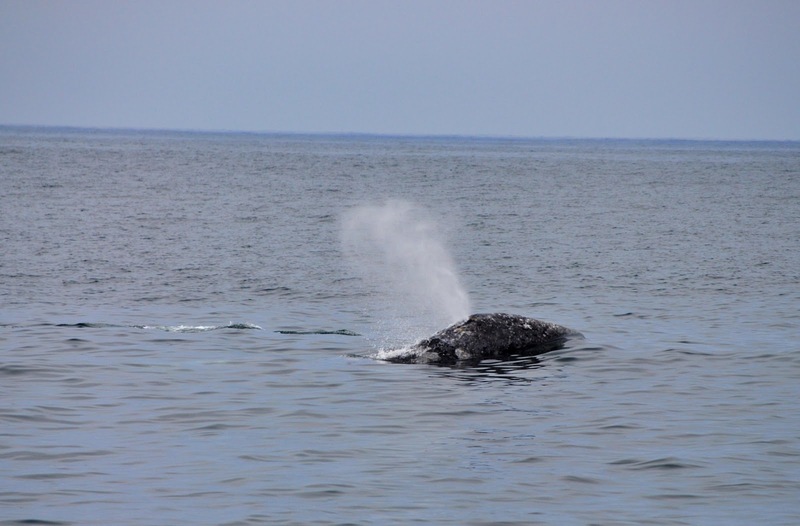 My husband has been whale watching a few times and has never seen a whale! We believe they see him coming and hide! 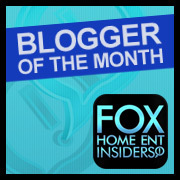 Love the dolphins we see though... Great post! This is wonderful!! We were whale watching many many years ago during a trip to Hawaii. So glad you enjoyed this with your family! Sounds like one of those adventures your kids'll never forget. Even better is the partnership with the tickets! Sounds like you had a fun memorable trip, maybe we can do something like this in our travels as well. What a great idea. This is great! I would love to experience that! the kids will always remember these adventures! Take me there someone will ya ?